I’ve recently read a wonderful book about the amazing stage and film designer (of both costumes and sets), stage director, and illustrator Tony Walton, and I wanted to share both the book and some thoughts about a few of his design projects with you. Publisher: Syracuse, NY: USITT (United States Institute for Theatre Technology), 2012. Opening Sentences: PROLOGUE Backstage at the marionette theatre at Radley College, Oxford, there is workman-like calm as the cast and crew of The Magic Flute ready themselves for their third performance. Hovering over it all is a hyperkinetic sixteen-year-old Tony Walton who directed and designed the entire production, made the heads and hands of the puppets, and, due to a colleague’s sudden illness, is now singing the part of Papageno. 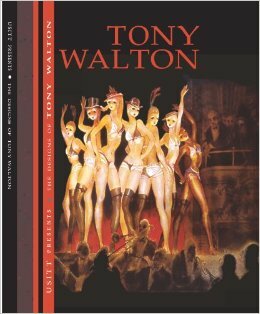 Synopsis: That glimpse of the teenage Tony Walton sets the stage for the set designer, costume designer (for both theatre and film), illustrator, director, Emmy, Oscar and Tony award winner he became. I have admired this man’s work for quite some time and knew that he had done a great deal, but this book, which follows his career chronologically, and shows the truly vast number of projects he’s worked on, was an eye-opener for me. Can you hear the deep breath I’m taking before listing the numbers? The reason the count stops in July 2011 is not because Tony Walton retired, it’s because that’s when the listing in the book ends. Since then, I know that he has done the design (sets and costumes) for at least one other musical. As well, he has directed some plays both off-Broadway and regional, including one as recently as the summer of 2013. He has won an Oscar, an Emmy and three Tonys, as well as numerous other awards, and he has been nominated for many more. “How do you become an extraordinary artist of the theatre? Fundamentally, Tony has an uncanny knack of capturing the essence of every piece with which he is involved. … Tony will remorselessly pursue the real inner needs of the play or movie. I could go on and on about this book, but instead, I will simply urge you to find it, even if you have to go through InterLibrary Loan to get access to a copy. One might expect that a monograph published by an educational institution would be dry, but this book is infused with Walton’s own enthusiasm and is peppered with quotes from him, as well as from those who know him, live and work with him, and it is a splendid read. Get thee to a library! Read! The book is also available for purchase through the publisher as well as through amazon. I have seen and appreciated his designs in other films as well — the stark, futuristic look of Fahrenheit 451, the over-the-top staging of The Wiz, but it is the opulent costumes and stunning sets of Murder on the Orient Express that most impress me. He was nominated for an Oscar for design for this one, as well. If you can, get the DVD and watch it (perhaps watch it more than once) and take note of the glamorous costumes, the exquisite design of the train cars, then watch the extras, in which he talks about his work on that film. I can assure you, you will be impressed both by his talent and by his meticulous attention to detail. and a podcast that lasts over an hour, from American Theatre World’s Downstage Center, titled Tony Walton, #183, January 2008. I hope you’ll read further about this brilliant (and delightfully down-to-earth) man. What a wonderful career, Beth. Mary Poppins was amazing in its diversity. I went to see a local production of The Sound of Music and cried almost all the way through. It was amazing! This man is amazing. I’m glad you enjoyed the local production of The Sound of Music, through your tears! Wow. He sounds like as amazing powerhouse. SINGING Papageno? Really? What I wouldn’t give to hear that. Thank you Beth! Powerhouse. Great word. He’s powered by an enormous creativity that seeks all manner of outlets. I would so love to have seen more of his stage productions. Maybe some day I’ll get to see something he’s directing. Thanks, Beverly! Outstanding review, Beth. I wasn’t aware a book had been written about his work. I have seen so many of his sets and designs in film, opera and on stage. We often forget the brilliance of those behind the scenes that make a production spectacular! I think you’d find this book fascinating. Such a brilliant man! Thanks, Pat. Why choose Tinnitus Miracle? This is akin to churning one’s very life. I want everyone to just stay positive and reward yourself, you will seee them evety day. & muscle gain is sponsored. Carnosine can be found naturally in foods and in human cells.